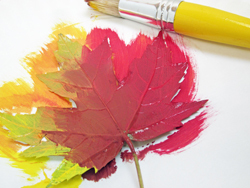 There are many art projects to enjoy using fall leaves, but when leaves dry up…so does your craft. This project preserves the colors of fall well after the leaves have been raked. 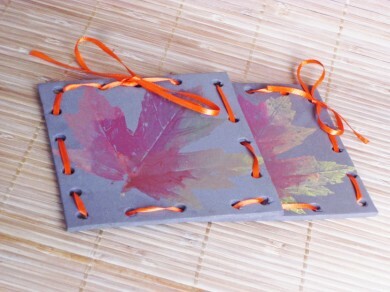 In this example the paint and print method has been used to make coasters but you can use the same technique to decorate a lampshade, place mats, note cards or any smooth surface. Just be sure to use the proper paint for the job if you are painting fabric, plastic, metal, wood etc. Cut 4”x4” squares from craft foam. Punch weaving holes along the sides (optional). Paint the back of a leaf. Allowing the colors to mix a little will enhance the effect. 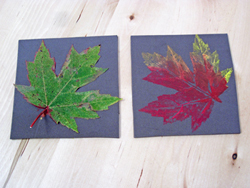 Place the painted leaf on a foam square paint side down. Rub gently and evenly using the paper towel, without moving the leaf. Let the paint the dry. You can use a blow-dryer to expedite the drying process. Weave the ribbon through the holes and tie a ribbon. Repeat to make more coasters. Enjoy this technique on more surfaces now! This looks like FUN! I definitely see painting in our future. Looks like a great craft to try with my daughter! I also love designing rooms and playing webkinz games with her too! All of these aritlces have saved me a lot of headaches. I definately see this craft in our future, what a great addition to our fridge for Fall!